Colorado Peak Politics | STARK DIFFERENCES? Who Knew Hick and Trump Had so Much in Common? STARK DIFFERENCES? Who Knew Hick and Trump Had so Much in Common? There’s a bizarre column in the Washington Post that proclaims Gov. Hickenlooper and President Trump are polar opposites. That’s not the strange part, we would expect to see striking differences between the two. What’s odd is the Washington paper failed to make their case. Granted, they were right that everyone knows who Trump is, and no one outside of Colorado has a clue who John Hickenlooper is, but are they “perfect opposites” as the Post proclaims? 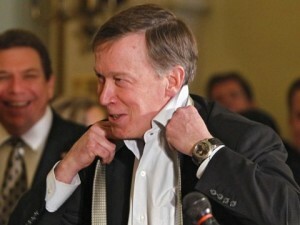 Hickenlooper is pro-business, the article claims. Whereas what? Billionaire businessman Trump is anti-business? We told you this was bizarre. Hickenlooper teamed up with a Republican to reform health care? Ahem, so did Trump. Hick is also strongly in favor of immigration reform, whereas Trump campaigned on immigration reform and takes heat every time he tries to make reforms. Hick is a moderate and … we don’t know what the polar opposite of a moderate is supposed to be. We can only assume it’s either liberal or conservative, in which case they have a point. The only real differences mentioned that separate the two were gun control, amnesty for illegals, and marijuana legalization. Which is pretty much the difference between most Democrats and Republicans. It all comes to naught, because according to the Post, a moderate white guy doesn’t stand a chance of winning the 2020 Democratic nomination. « HELP WANTED: Sure, Polis Will Create Jobs, But Do We Want Them?